Ok, I’ve had enough now. It was very kind of you to work so hard in January. I’m really not worried about a hosepipe ban this year. But I am worried that if you don’t stop soon, I’ll be able to canoe to the allotment. Yours, ever so slightly damp, from London. PS Also, I have to run a school gardening club through the depths of winter and you’re making life very difficult. Easy-peasy, quick results and cheap to do – this one is ticking a lot of boxes. Last week I sent ten 7 and 8 year olds home with a tray of planted peas each, plus instructions to place them on a windowsill inside and water every couple of days. A week later and my mini gardeners are reporting that all the trays are showing signs of germination. 100% success, I like that. 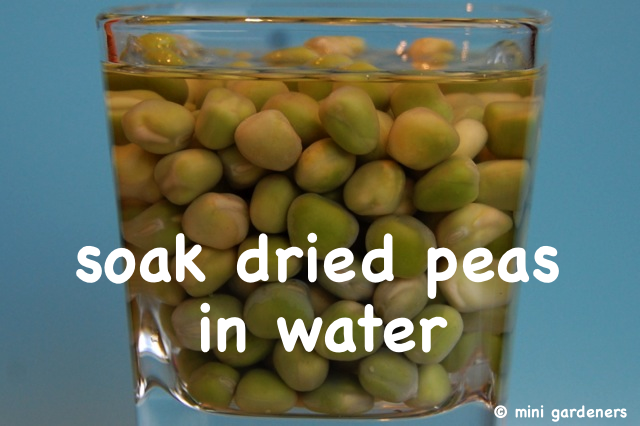 The peas we planted were dried (marrowfat) peas from the supermarket that I had soaked overnight in water. Then we took some recycled plastic food containers with holes in the base and half filled them with compost. 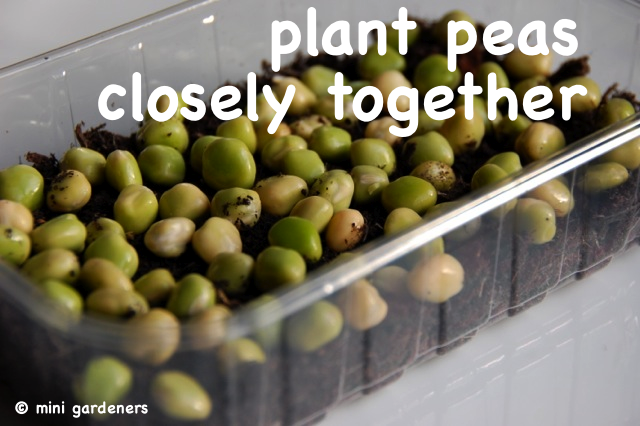 We placed a layer of peas on top, keeping them in a single layer but packing them quite closely together. We covered with compost, watered, labelled and then put in a light place. Shoots generally started to appear within 3 to 5 days. 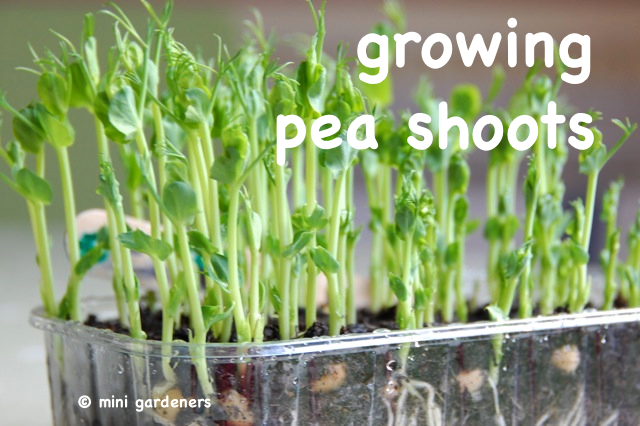 Within 2 to 3 weeks the first pea shoots should be ready to harvest and, if we’re lucky, we may have 2 to 3 harvests from each tray. On a completely different subject, today we took root cuttings of mint. To keep things interesting, we used Moroccan mint, pineapple mint and chocolate mint. 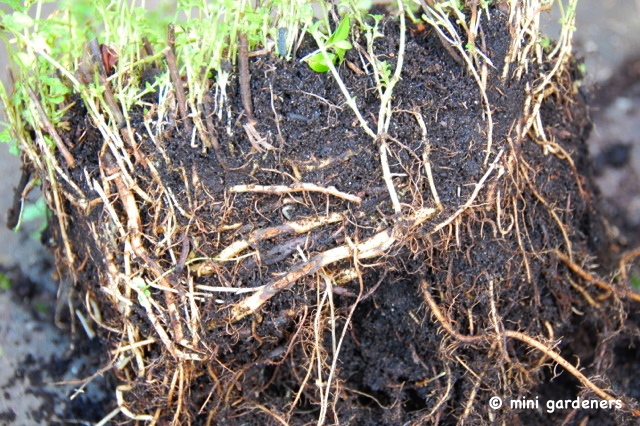 The Moroccan mint plant was living in a terracotta pot last year and you can see how the roots have started to spiral round the inside of the pot. This is such a vigorous mint that I usually repot it every spring anyway. 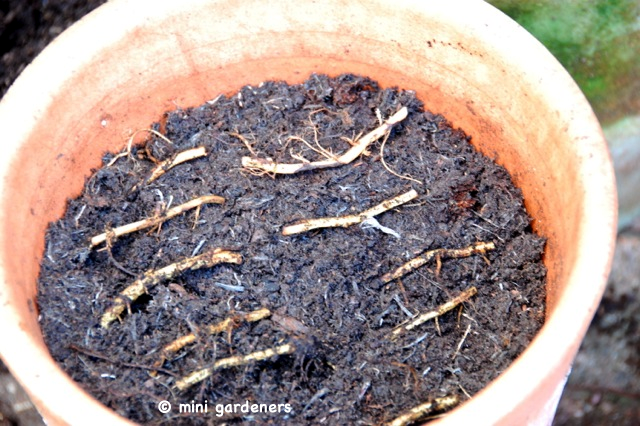 Repotting is as easy as cutting sections of root, placing them on the compost surface and covering with a thin layer of compost. Which left plenty of roots for the whole gardening club to have a small pot each plus some spares. Like the peas, these are fairly robust plants. We’ll leave them outside to fend for themselves and when shoots start appearing, they’ll be taken home to keep. Categories: grow your own, plants for children, school gardening | Tags: children, gardening, mint cuttings, pea shoots, school | Permalink.